We know age means more disease, and as people live longer, we see more cancer and heart attacks, but what causes it? One of the key factors is inflammation. Inflammation, which is driven by our immune system, is vital for staying alive. It sends white blood cells and antibodies to attack invaders like bacteria, and it moves protein into cuts to heal them. These are healthy functions, but unfortunately, sometimes inflammation attacks the wrong things. The balance between healthy and unhealthy inflammation changes after we get to middle age. Older people in normal health usually have higher levels of low grade, symptomless inflammation, compared with younger counterparts; unfortunately, substantial evidence associates this inflammation with major diseases (see Ailments). The problem even has its own word, ‘inflammage’, which refers to the unique relationship between inflammation and getting older. With the passing decades, inflammatory insults, all the infections and foreign bodies ever cleared away, leave their cumulative influence on the thermostat; a higher setting becomes the new normal. Cells that reach their natural lifespan, of which there are more and more with time, call up an inflammatory response to have themselves cleared away. The tiny furnaces in cells that burn food for energy, called mitochondria, become less efficient with age, like old cars. Inefficient furnaces put out more pollution, which, when burning food, means unstable oxygen based molecules called free radicals. Oxygen is well known to destroy what it touches (like with rust and rotten meat), and free radicals attack the cells that made them, along with other vital infrastructure, like DNA. This last factor explains the value of anti-oxidants, which are molecules that neutralise free radicals. Coloured fruit and vegetables are full of anti-oxidants, and eating them in abundance is a key strategy for managing ageing. Anti-oxidants can also be extracted from plants that are not usually eaten outright, and consumed as a supplement (See Why Nutraceuticals Matter). The inflammage is far from benign, and staying healthy beyond middle age has a lot to do with managing it. Exercising, eating plants, and other concentrated anti-inflammatory products, play an important role in keeping the system in balance. 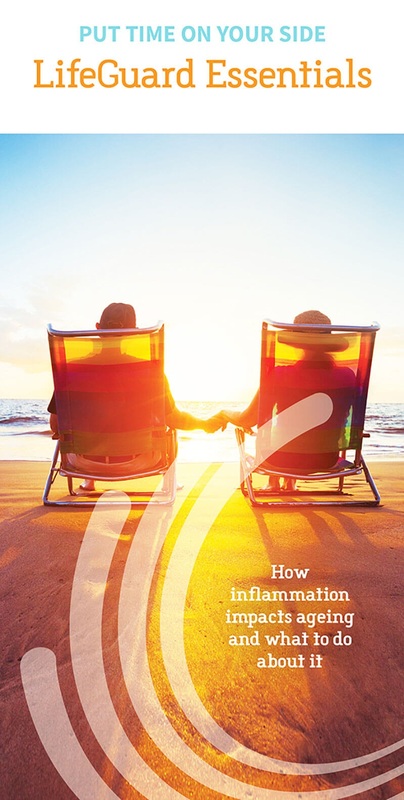 Healthy ageing means managing inflammation, and you can read more about the choices you can make to age well, in our free brochure.